COM AS ÚLTIMAS MUDANÇAS DE CANAIS NO C2 E ADIÇÃO DE TODOS OS TPs DO C4. TAMBÉM COM OS CANAIS DA SKY, INTELSAT 11. 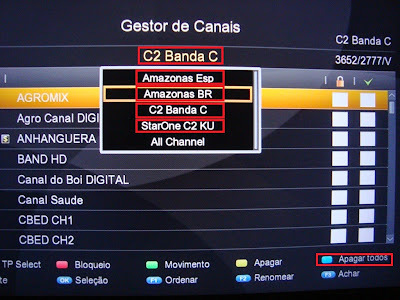 LISTA DE CANAIS (DUMP) DOS SATÉLITES AMAZONAS KU, STAR ONE C2 KU e BANDA C e INTELSAT 11, PARA QUEM NÃO QUISER ORGANIZAR MANUALMENTE.